Shia worshippers in the Iraqi capital Baghdad and the northern city of Kirkuk have been targeted in a series of car bomb attacks. At least 19 people have died and more than 100 have been wounded. Blasts hit mosques in the Baghdad areas of Zafaraniyah, Binook, Qahira, and Jihad during Friday Prayers. The Kirkuk attack was reported at the same time. Violence has decreased in Iraq since the peak of the insurgency in 2006 and 2007, but bombings are still common. Sunni Islamist militants linked to al-Qaeda have vowed to step up attacks on Shia and official targets this year, in an attempt to weaken the Shia-led government. The blasts occurred at Shia mosques across Baghdad as worshippers were emerging from Friday prayers. At least 16 people were reported to have died and about 30 people have been wounded. 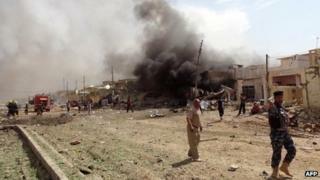 An AFP reporter in the Qahira district described seeing pools of blood and massive damage to cars, houses and shops. Several residents were crying as soldiers imposed a heavy security presence in the area, AFP reports. The blast in Kirkuk, some 240km (150 miles) north of Baghdad, happened when a suicide bomber drove an explosives-laden car into a group of worshippers outside the mosque, police Col Najat Hassan said. At least three people are reported to have died, and some 70 people have been wounded. "We were listening to the cleric's speech when we heard a very strong explosion. Glass scattered everywhere and the roof partially collapsed," said Mohammed, one of the worshippers. As many as 60 people were killed in a series of car and suicide bombings in mainly Shia areas in and around Baghdad on 19 March - the 10th anniversary of the US-led invasion that toppled Saddam Hussein. The violence comes at a time of deep political crisis in Iraq, with Prime Minister Nouri Maliki sharply at odds with a range of political forces, including the Kurds, most of the Sunni groups, and many factions within his own Shia community. With its massive oil reserves, Kirkuk - home to a mixture of Arabs, Kurds and Turkmen - is one of the most bitterly contested of Iraq's disputed territories. The Kurds want to incorporate it into their largely autonomous region, while Arabs and Turkmen oppose any change to its current status, ruled directly from Baghdad. Militants often exploit tensions between the Iraqi and Kurdish security forces by launching deadly attacks in the city, correspondents say.